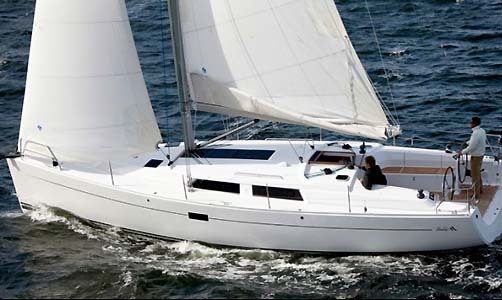 The German built Hanse 400 sailing yacht is a high volume, fast family cruising boat offering a fun day at sea for up to 9 guests. 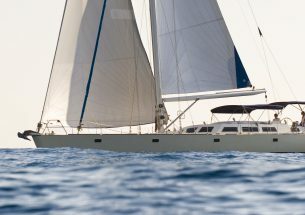 Key features include teak cockpit, carbon steering wheels, big sundeck, underwater lights at night, big bimini top. Below deck, the saloon has an abundance of outward opening windows allowing ample ventilation and airflow, while keeping rainwater out. The galley offers a cooking space with a stove, refrigerator and sink. 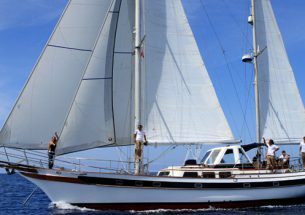 Moored near the popular Lio in Ibiza Town this sailing yacht is a great alternative to a speedboat crossing to Formentera. The fun is in the journey. 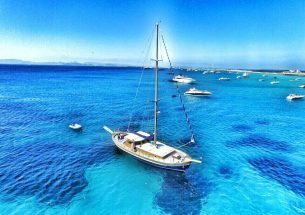 The price includes IVA, skipper, fuel, cold drinks, snacks and fruit for guests, standard equipment, mooring in base port and full insurance. The price does not include mooring out of base port.